What Is The Fitbit Ionic?- Cutting Edge or Waste Of Money? What is the Fitbit Ionic? Is it a fancy pedometer? A smartwatch? Maybe a heart rate monitor? Correct answer: all of the above. 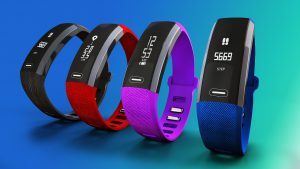 If you are familiar at all with the Fitbit brand, you know their products are centered around fitness monitoring. They started with pedometers that prided themselves in tracking every step and have progressed over the years to track all kinds of health info, including sleep patterns and heart rates. All of this progress has led Fitbit to create their newest product, the Fitbit ‘Ionic’. The ‘Ionic’ is not only their most sophisticated fitness tracker to date, but it’s also the beginning of something else for Fitbit…an introduction into the smartwatch game. I want to start with a quick summary of Fitbit and their products to show how they have progressed toward the Ionic over the years. Fitbit officially started about 10 years ago with the creation of their first tracker- basically a sophisticated pedometer that tracked how many steps you took that communicated with a separate base to store info and charge. Pretty cool at the time, but oh how the times have changed. Fitbit progressed from the original clip on tracker to the ‘Ultra’ and the ‘One’ (both no longer available) to the now available Fitbit ‘Zip’ (I love these names by the way). The ‘Zip’ is currently the only clip on tracker they still produce. It really only tracks steps and has a clock, but the nice thing is that it doesn’t have to be charged. Instead, it uses a watch battery. Good for the folks that really only want to track steps (i.e., those looking for a pedometer). The Fitbit ‘Alta’ came out the same year as the ‘Flex 2’, with the addition of a clock and tap display to see your stats. Things are starting to get a little more sophisticated. Next came the ‘Alta HR’ with the addition of…you guessed it…HR (heart rate) monitoring. This signifies a pretty big step forward for the company because heart rate monitors have become very popular. And for good reason. Keeping track of your heart rate is a great way to ensure you are working out at an intensity that will get you the results you want. Not to get into too much detail here, but keeping your heart rate at a certain level will ensure you are burning fat, improving cardio endurance, etc. Maybe more on that in a future post? Fitbit and gotten into the HR game a little earlier with the ‘Charge HR’, which is no longer available. Next up the product chain comes the Fitbit ‘Charge 2’, their most sophisticated tracker before getting into smartwatch territory. The ‘Charge 2’ will track steps, floors, sleep, and heart rate. Has some limited GPS capabilities through your phone as well. A very popular model that a lot of folks are still sporting today. For a detailed review on the ‘Charge 2’, click here. Now we get to Fitbit’s first attempt at a smartwatch, the ‘Surge’. Tracks everything the ‘Charge 2’ does, but also has GPS and multi-sport modes. Pretty solid watch, but pretty bulky, not very attractive (no offense Surge). After the ‘Surge’ came the ‘Blaze’, which is still offered today. The ‘Blaze’ seemed to fix a lot of the major concerns with the ‘Surge’: considerably more attractive, more accessories (switching between fashionable bands and frames), color touch-screen. They also added on-screen custom workouts which is pretty cool. Using the Fitbit workout app (FitBit Coach), you can choose your workouts and then see them on your watch in real time. With the ‘Blaze’, Fitbit was trying to step their smartwatch game up a little. Trying to hang with the big boys if you will. You know, Apple. So, up until about 2 months ago, the ‘Blaze’ was king of the Fitbit hill. But, as we just learned, Fitbit keeps on progressing, keeps on adding and tweeking. Seeing what works and what doesn’t. Continuing to progress and produce newer and newer models. But I guess that is just where we are these days in the market. If you aren’t continuously coming up with the next best thing you are going to get left behind. I got a little off topic, sorry folks. But back to the point, one of the things that makes Fibit so popular and so successful is their ability to continuously improve their products. The company has really only been around for 10 years, and look at the above list of products I discussed briefly. It’s a bunch, and I’m sure I left out a few. For a really good chart comparing the different models, check out this wikipedia page. So, we’ve made our way to the Fitbit ‘Ionic’. Their smartest ‘smartwatch’ to date. Let’s take a closer look. P.S.- the ‘Blaze’ is still available, still fairly popular. The ‘Ionic’ looks the part. It’s sleek, cool, stylish. Looks like Fitbit took a page out of Apple’s book when designing it. Smart move, because not only do Apple products sell like hot cakes, but they do tend to look cooler than the competition. But looks aside, what does the ‘Ionic’ have to offer? I’m going to break the features into 2 categories: the fitness tracker stuff and the smartwatch stuff. Helps me with my organization and I think it’s a good way to think about the product and what you are really looking for. So, the fitness tracker stuff first, here we go. At it’s core, the ‘Ionic’ is still a fitness tracker. Like all of it’s predecessors, it is going to keep track of all of your steps, but this model steps it up a notch. The Smart Track feature automatically recognizes what type of exercise you are doing and records your data automatically to the app. Running, walking, playing tennis, swimming- doesn’t matter, ‘Ionic’ will record your data so every workout is counted! Oh, almost forgot- the ‘Ionic’ automatically recognizes when you start running so it starts tracking automatically. The ‘Ionic’ comes loaded with exercise routines and will display the workouts on your wrist as you are performing. It’s like having a mini-personal trainer with you at all times. The screen shows you how to do the exercises, then alerts you when it is time to start- really keeps you moving. The ‘Ionic’ has a bright, color screen so watching the workouts is pretty comfortable. This feature seems to be a favorite of many owners. The built-in GPS tracks your runs (or hikes, or bike rides) and displays stats like distance and pace. It also maps out your route once you are all done. That’s pretty cool. The hiking mode will even tell you how high in elevation you climbed! This feature uses GLONASS to take advantage of satellites globally, gives you more accurate results with all of your stats. Personally, this is one of the features I am most impressed with. I’ll admit, I don’t run that much (especially outside), but if I did, I would be interested in this. Keeping track of distance would be a breeze, as well as pace and calories burned. If you enjoy hiking this is also a huge plus. The ‘Blaze’ is water resistant, the ‘Ionic’ is water proof. You can and should go swimming with the ‘Ionic’. It wants you to so it can track it for you. Yes, it has a swim mode that will keep track of your distance, calories burned, stroke, etc. Pretty amazing. And of course, it is all stored for you on the the app so you can review. It measures resting and active heart rates. This is valuable info if you like to track your heart rate during workouts, which a lot of folks do. You can spend $100 or so on a nice heart rate monitor alone. The ‘Ionic’ does it for ya, and will let you know if you need to step it up or not during workouts to reach your target heart rate. Keeping track of heart rate will also make your calorie counts a little more accurate. Apparently, the technology the ‘Ionic’ is using to calculate heart rate is newer and more sophisticated than their previous versions. Oh, and if your resting heart rate seems to be increasing, this Fitbit will help you with guided breathing exercises to help you relax. Yea, no joke. The ‘Ionic’ tracks how much time you spend each night in light and deep sleep, I think it’s based on your heart rate. You can set “sleep goals” and it will recommend what time you go to sleep each night. Kinda neat I guess, also kinda weird having my watch set a bedtime for me. But a lot of people are interested in tracking sleep data and it’s a nice feature to have if you are interested. The Fitbit ‘Ionic’ can store up to 300 songs, no need to bring your phone to the gym (or on that run). It’s always more fun to workout to music and it is a hassle having to have your phone in your pocket or strapped to your arm. Playing music from your watch is a nice bonus. I feel like everything plays music these days. I love music so I’m all in. Fitbit offers their own wireless headphones, the Fitbit Flyer, as well. As a smartwatch, you can download apps directly to your wrist. Apps will continue to be developed for Fitbit, but already you can download weather apps, Pandora, and Starbucks app to name a few. FitBit programmers will continue to offer more and more apps as time goes on. Similar to Apple Pay, the Fitbit ‘Ionic’ has a program that allows you to save a credit or debit card directly to your watch. Pretty cool, if you find you’re out running through town and need a drink, you could buy one without your wallet or phone. Nice feature to have when you need it. Similar to the ‘Blaze’, the ‘Ionic’ will notify you when you are getting a text message or call on your phone, or alerts from some apps on your smart phone. This is convenient, I guess, but be aware that you can not respond to these alerts in any way. The Fitbit ‘Ionic’ does not have the capability to answer phone calls or text messages. Find the clock look you want with customizable faces. Switch between classic and more animated faces based on your daily mood or setting. Something fun to play with. This advanced battery life comes in handy when you are tracking sleep habits or maybe going out for a weekend full of hiking. No need to worry about packing a charging cord because your FitBit ‘Ionic’ will still be going strong after several days of use. So as you can see, this product has a lot to offer as both a fitness tracker and smartwatch. A nice benefit of the ‘Ionic’ is that you can get both functions in one product, you don’t have to choose one over the other! I know I just went over a lot of information, so I’m gonna sum up the pros and cons in a nice list for ya. If you ask me, the pros definitely out way the cons. It’s another nice product from a company that has flourished by producing nice products. But what really matters is, “Is this the right product for me?” (and by “me” I mean “you”, the reader). If you aren’t convinced yet, keep reading, see what you think. Ok, so right off the bat, you are probably comparing this to the Apple Watch. I know I am. I mentioned the Apple Watch a few times earlier on purpose. Apple seems to be the gold standard with smartwatches these days, so anytime a new player is introduced, it’s natural for there to be a comparison. Which is better, the Fitbit ‘Ionic’ or Apple Watch? Well, I think that depends on what you are really looking for. Are you more interested in the “smartwatch” features or the “fitness tracking” features of the watch? Because I am going to be honest, if you are more interested in making phone calls, answering texts, checking e-mails from your watch, then you should get yourself an Apple. Apple is way more sophisticated in the smart features. Remember, you can not respond to texts or calls from your ‘Ionic’, you can not make phone calls from your ‘Ionic’ even if your phone is in your pocket. The Apple Watch has more sophisticated apps and more options to choose from as well. But, if fitness data is what you are interested in, then Fitbit is the way to go. Fitbit has made a name for themselves by being the leader in fitness tracking, it’s what they do best. And for the price, the ‘Ionic’ is going to be hard to beat. Remember, the Apple Watch only works with, you guessed it, Apple products. The Fitbit ‘Ionic’ is compatible with all operating systems, FYI. With their built-in GPS (admitted, Apple also has GPS) the fitness tracking has been taken to a whole new level. And that battery life is amazing! No matter how nice the new Apple Watch is, if you are constantly charging the thing, it makes it harder to use and keep up with your busy lifestyle. So as you can see, there are some pretty big differences between the two watches. Significant enough to warrant the price difference? Well, that’s a personal question, but the correct answer is “yes” (ha, just kidding). In all seriousness, the ‘Ionic’ is a pretty big step forward from the ‘Blaze’. If you are a first time buyer and are stuck between the two, I would recommend the ‘Ionic’. If you already have a ‘Blaze’, consider the new features and make an educated decision. I almost forgot to talk about the price of this thing. Geez. That’s kind of an important subject. The Fitbit ‘Ionic’ is going to cost you about $300 give or take. Click here to see best price currently on Amazon. When compared to the Apple Watch which will cost anywhere from $329 – $749 depending on options, it’s not that bad. The Samsung Gear S3 will run ya about $350. Garmin smartwatches can cost anywhere from $250 – $800 depending on model. In the smartwatch world, the Fitbit ‘Ionic’ is priced reasonably. Puts it right in line with the other big competitors. FitBit Ionic- Cutting Edge Fitness Tracker! So to answer my original question, “What is the Fitbit Ionic?”, the answer would be cutting edge fitness tracker! I’ve gone into the details above to defend my answer and I stick by it. Top of the line, built-in GPS…MP3 player…makes payments…personal training…world-class heart rate monitor…and so on and so on. The ‘Ionic’ is the most sophisticated product Fitbit has introduced to us thus far, and it is by no means a waste of money. The real question is whether or not it is the right watch for you. Only you can answer this one, but I have no doubts that you will be satisfied with the ‘Ionic’ as long as you know what you are getting. Remember, the ‘Ionic’ is more of a fitness tracker than smartwatch. It has some smartwatch capabilities, but if you are really looking for the phone calls and messaging aspects of it, you really would be better off with an Apple Watch or other brand. The ‘Ionic’ can’t offer you those functions, yet. But if you are truly looking for a watch with awesome fitness data tracking and a reasonable price tag, the ‘Ionic’ is your best bet. With an average user rating of 4.1/5 on Amazon, the results speak for themselves- people are happy with the ‘Ionic’! I hope this review was helpful for you. I enjoyed doing the research and writing this review. As always, I think it’s important to be informed before buying anything. I enjoy doing research on products and I enjoy sharing with others. If you have any questions or comments, don’t hesitate to hit me up. Also, if any of you are currently using the ‘Ionic’, I would love to hear what you think. The Best Christmas Gifts For 2017- 12 Gifts Guaranteed To Blow Their Minds! if you do, hit me again and let me know how you like it. I think you will be pleased. Great post, I’ve never bought a Fitbit, but always thought they would be really interested to have. You’ve got a lot of information on them. I’ve been debating an ionic primarily for sleep tracking purposes, but it doesn’t sound like the capability here is all that strong. I’ve looked into several items that are specifically for sleep tracking and they seem to have very mixed reviews. Are you familiar with any other fitness related trackers that do have a highly regarded sleep tracking system? The Ionic is actually pretty good at sleep tracking- it has an accurate HR monitor that it uses to determine which phase of sleep you are in, and then it keeps track of this data and can show you your sleep patterns over time. It will then even give you recommendations on how to improve sleep quality. Also, I don’t think I mentioned this in the article, the Ionic has a sensor in it that will eventually be used to measure spO2 (oxygen saturations of blood, much like a pulse oximeter). This is a HUGE development, because in terms of sleep, it will be able to measure your oxygen saturation while you sleep and tell you if you are having episodes of sleep apnea. All fitness trackers will use similar technology to assess sleep patterns, that is they will use HR. If sleep tracking is your primary goal, you could look into getting a sleep tracker that sits beside your bed or actually slides under your sheet. But in terms of wearable sleep trackers, the Ionic is as good as any other I have come across. I didn’t know about this specific brand. I don’t need an apple watch yet, it will probably distract me anyways but I am looking into all possible options. One thing I am checking is the performance rate of the apps. What can you tell me about the performance of the workout app of Fitbit? The Fitbit Coach is their custom workout app, it’s getting pretty good reviews. It gives you access to hundreds of workouts as well as audio coaching. People seem to love the exercises and workouts, but there have been some complaints about user friendliness. Apparently it takes awhile for the exercises to download and transitioning from one exercise to the next can be slow at times. All in all, I’d say it’s a solid app with plenty of potential for upgrades. P.S.- you have to pay $40 a year to subscribe to the app.